The default page format for OpenOffice is Letter. We could change it to A4 format by using the Page Style options. 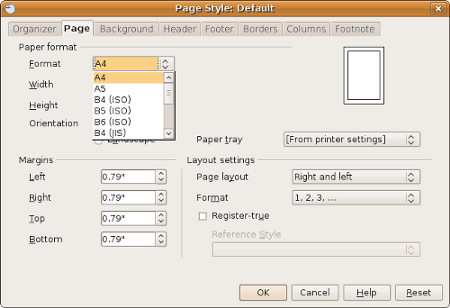 Under the Format Page section, choose the A4 format from the Format drop box. Unfortunately, we have do these steps for each new document. 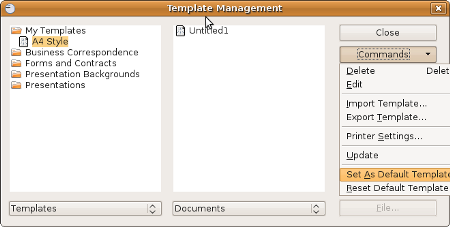 To make this changes permanent, save this document as template, and set the saved template as the default one. Save as template: File > Template > Save. Give a name to the template. Set template as default: File > Template > Organize. Choose the template name that we had save previously. Click Commands on the right pane and choose Set As Default Template. From now on, each new document will have format A4. mcm mana dengan integration ms office eh ? @KNizam: Rasanya untuk orang awam tiada masalah. IMHO, masalah hanya akan timbul jika kita menggunakan features tertentu dalam MS Office mahupun OpenOffice. @KNizam : OpenOffice nie memang best, integrate well with MS Office. Ermm..bukan kerajaan kita pun dah berubah kepada OpenOffice ker? P.S: Aku ingatkan saiz standard OOo nie A4. Bukan yerk?